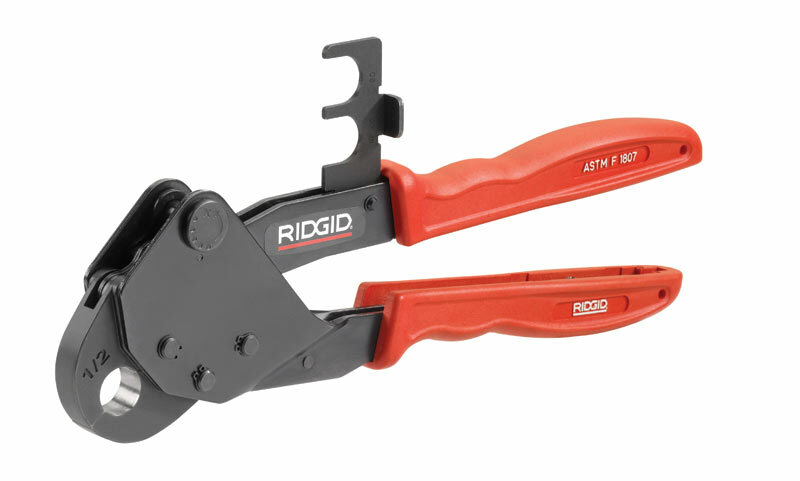 The new RIDGID® Close Quarters ASTM F1807 PEX Crimp Tools are the latest addition to the company’s PEX tool lineup. With handle openings up to 70 percent smaller than standard PEX crimp tools, the new Close Quarters tools give contractors the ability to maneuver easier in tight spaces. Available in ½” and ¾” sizes, the Close Quarters tools are ideal for making connections in potable water and radiant heating applications. Features include durable, glass-filled polycarbonate E3™ handles to improve user comfort and reduce operator fatigue; an exclusive, built-in, Go/No-Go Gauge that folds into a handle for easy access and storage; and an adjustable lock screw for easy tool calibration. Made for use with ASTM F1807 copper crimp ring PEX tubing connections, these tools are available through traditional U.S. and Canadian plumbing distributors and come with the RIDGID Lifetime Warranty against Material Defects and Workmanship. The Close Quarters PEX Crimp Tools expand upon current RIDGID product offerings for ASTM F1807 PEX including standard PEX Crimp Tools (available in ½" – 1" sizes) and battery-operated Press Tools with PEX jaws (available in ½” – 1- ¼” sizes).